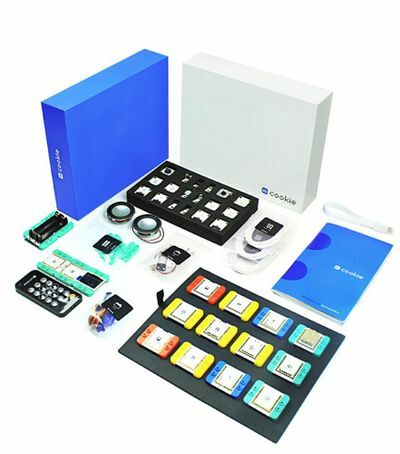 mCookie Kits are kits that contains various mCookie Modules and accessories in a bundled package. There are several maker kits designed for various levels of expertise and project complexes. In addition, there are project kits which aim to provide all components for a single complete project. mCookie Maker Kits are designed for makers to come up with their own projects. These kits provide the basic building blocks to create a large variety of projects. There are currently three tiers of maker kits starting with mCookie Basic Kit, followed by mCookie Advanced Kit, and finally mCookie Expert Kit. Additional mCookie Modules, components, and accessories are added as tier level increases. There are currently two generations of mCookie Maker Kits, the first generation with suffix -01 and the second generation (current) with suffix -02.
Notable improvements are an improved mCookie Hub, better sensor cables, new modules types, mBattery, and universal sensor and trinket sizes with new building brick housings. mCookie Project Kits are designed to be complete kits that contain everything need to build and complete a project or a set projects. There is currently one mCooke Project kit, which is the Itty Bitty City kit. This page was last modified on 7 December 2016, at 23:03.